It is with heavy hearts we release our latest River City Chapter member to the Forever Chapter. 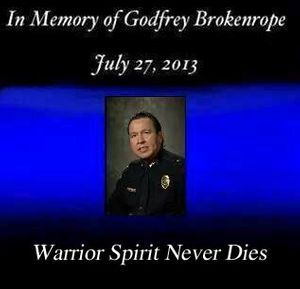 Godfrey 'Rope' Bokenrope, Chief of Police in Aurora, Nebraska died from injuries in a motorcycle accident which occurred 25 July. Godfrey leaves behind a wife and three adult children. In his short time with the club, 'Rope' contributed greatly in so many ways. Though these are just a few of his contributions, his greatest was his presence! Rope truly exhibited the Warrior Spirit. His zest for life was amazing. He took great pride in his family, his culture, and work. Our thoughts are with his family, friends and coworkers. His physical presence will be missed greatly, but his warrior spirit will be with us forever.